The information provided here is for versions of Dynamics 365 prior to Dynamics 365 (online), version 9.0. For the latest documentation, see Potential issues and resolutions. The following are known issues with Microsoft Dynamics 365 for tablets. Understand what operating systems, devices, and languages are supported. Review the requirements in Support for Dynamics 365 for phones and Dynamics 365 for tablets. Dynamics 365 uses a security privilege, Dynamics 365 for mobile, to provide access to Dynamics 365 for phones and Dynamics 365 for tablets. The privilege is pre-configured for Sales roles, but not other security roles, so you may want to add to other roles for your teams. If this message appears when a user starts the mobile app, taps the Home button, or selects Dashboards from the menu, the user likely doesn’t have access to the expected dashboards. In the web app, go to Settings > Customizations > Customize the System. Select Display to everyone and then click OK. If you prefer to display only to select security roles, be sure to select your user’s security role. Have your user close and open the mobile app so your dashboard changes will download. From the mobile app, tap the menu and then tap Dashboards. On the command bar, tap Select Dashboard and then select the dashboard you would like to use as your home page. On the command bar, tap Set as Home. In the web app, go to Sales > Dashboards. Enter a name for your dashboard and select Enable for mobile. Add the components you want on your dashboard and click Save. In the mobile app, follow the previous procedure to select your new dashboard and set it as your home page. Cause 1: The Dynamics 365 server is down. Verify that the server is on and connected to your network. Cause 2: Your Dynamics 365 version is not supported. See Support for Dynamics 365 for phones and Dynamics 365 for tablets for version support information. Cause 4: This error can also occur if you enter an invalid URL. Make sure the same URL you have provided works to access Microsoft Dynamics 365 in your browser on your device. Cause 5: If you connect to a Microsoft Dynamics 365 on-premises organization, this error can occur if the certificate from the Microsoft Dynamics 365 website is not trusted by the device. To avoid this scenario make sure to use a publicly trusted certificate. For more information, see Your server is not available or does not support this application. Error message: "You haven't been authorized to use this app. Check with your system administrator to update your settings." Cause 1: Verify that your Microsoft Dynamics 365 security role includes the Use Dynamics 365 for tablets privilege. See "Required privileges" in Get started with Dynamics 365 for phones and Dynamics 365 for tablets. Access the Users and Groups section within the Microsoft Online Service Portal and verify you have a Microsoft Dynamics 365 (online) license assigned to your user record. Cause 1: This error can occur when connecting to a Dynamics 365 on-premises organization that is not configured for IFD. For more information, see Configure IFD for Microsoft Dynamics 365. You can’t connect to the server because it doesn’t have a trusted TLS/SSL certificate. This error can occur when connecting to a Dynamics 365 on-premises organization that does not have a certificate configured correctly. For more information, see “Certificate selection and requirements” in the white paper Configuring Claims-based Authentication for Microsoft Dynamics CRM Server. Error message: "You need an internet connection to use this app. Reconnect and try again." Cause 1: This error can occur if you do not have an internet connection. Verify you are connected to the internet and can access the same URL in your web browser. Cause 2: Check if you are using a preview build of Windows 8.1. So far this issue has only been reported with the preview version of Windows 8.1. Error message: "Sorry, something went wrong while initializing the app. Please try again, or restart the app." Cause 1: Permissions might not be set properly. See "Required privileges" in Get started with Dynamics 365 for phones and Dynamics 365 for tablets. An error occurs in the Microsoft Dynamics 365 app for users in child business units. For more information, see Sorry, something went wrong while initializing the app. Error Message:System.NullReferenceException: Object reference not set to an instance of an object. Cause 3: This can occur if the download of the metadata failed. The next attempt to connect will fully regenerate the metadata and successfully connect. Microsoft is aware of an issue where metadata may fail to download due to a timeout and plans to address this issue in a future update. Cause: This error will occur if one of the supported languages is not enabled in Microsoft Dynamics 365. For more information on the supported languages, see Help & Training: Dynamics 365 for tablets: Set up and use and expand What you need to use Dynamics 365 for tablets and Supported Languages. If you receive this message for a record which has a non-deleted process assigned to it, you should manually synchronize Dynamics 365 for tablets with your Microsoft Dynamics 365 data. Close the Dynamics 365 for tablets app, reopen, and then choose to download the latest customizations. This procedure forces Dynamics 365 for tablets to check for updated customizations. Recently viewed data while you were connected is cached and synched. Record data like Accounts or Contacts are not synched. You can’t choose which data synchronizes to the device like you can with Microsoft Dynamics 365 for Outlook. This error may occur for the following scenarios when you are using a Windows 88 device and you have a Microsoft Dynamics 365 (online) organization that uses Microsoft account (formerly named Live ID). This issue doesn’t occur for organizations provisioned through Office 365. Cause 1: You are automatically authenticated as a different Microsoft account that is not a member of the Microsoft Dynamics 365 organization. This may happen if you sign into your Windows 8 device and your domain account is connected to a Microsoft account. For example: you sign in to your device as <userid>@contoso.com (your domain account) and that account is connected to <userid>@live.com (a Microsoft account). If your connected account (for example, <userid>@live.com) is not a member of the Microsoft Dynamics 365 organization, you will encounter this error. In this scenario, the error occurs after providing your URL, but you are never prompted for credentials. 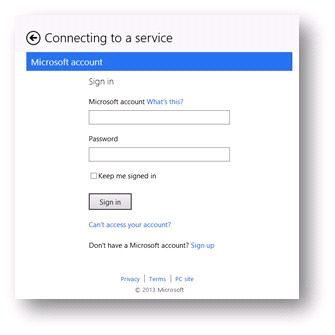 When you connect your domain account to a Microsoft account, that account will be used to automatically sign in to apps and services that use Microsoft account for authentication. If you’re using a Windows 8 device, use the steps listed here to check if your domain account is connected to a Microsoft account. If you’re using a Windows RT device, see the Windows RT section. Swipe from the right side of the screen to access the charms bar and then tap Settings. If you are using a Windows RT device and need to authenticate as a Microsoft account that is different than the one you use to log on to your device, you must create another account and switch to that account when using the app. For example: you currently sign in to your Windows RT device as <userid>@live.com, but want to access your Microsoft Dynamics 365 organization via the tablet app as <userid>@outlook.com. For more information on how to create a new account on your device, see Video: Create a user account. The app couldn’t navigate to https://port.crm.dynamics.com/portal/notification/notification.aspx?lc=1033\&organizationid<OrganizationId> because of this error: FORBIDFRAMING. Cause 2: This error may occur if you previously authenticated to the app as a different Microsoft account and chose the option “Keep me signed in”. Even after uninstalling and reinstalling the app, the token for the previous credentials is still stored on your device. If you are trying to connect as a different user, you will need to remove the token. To completely clear the app, after you uninstall the app, you must clear the Indexed DB folder (Drive:\Users\%USERNAME%\AppData\Local\Microsoft\Internet Explorer\Indexed DB). You may have to sign in as a different user and use the command prompt as an administrator to clear the Indexed DB folder. That is because some files in this folder can be held by the Host Process for Windows Tasks. Once the token is successfully removed, you should see the sign-in page after you enter your URL in the app. The same error as Cause 1 may be found in the traces. Cause 3: You have not accepted your invitation to the Microsoft Dynamics 365 organization. If you attempt to access the same URL through your browser, you see a notification that you are invited to the organization but need to accept the invitation. Once you accept the invitation, you are able to configure the app successfully. The app couldn’t navigate to https://port.crm.dynamics.com/portal/response/Response.aspx?token=KFES-CK5C-NL8R-X1U0\&expiration=635211904207200000\&cs=Lkya6zs9EeOtJXjjtRc6AeZa5xqt94YAppfqrXFgZa5slinq2iaabTmwfX0AR4HLGvz\&cb=invite\&cbcxt=invite\&<username>%40live.com&lc=1033 because of this error: FORBIDFRAMING. Cause 4: If you connect to a Microsoft Dynamics 365 organization on an Android device, this error can occur if the certificate from the Microsoft Dynamics 365 website or the federated server, such as AD FS, is not trusted by the device. To avoid this scenario, make sure to use a publicly trusted certificate or add the Certificate Authority certificate to the device. For more information, see KB article: While configuring Dynamics CRM for phones and tablets, you receive an error message. Users must update to the latest version of the Microsoft Dynamics 365 for Good application prior to updating to Microsoft Dynamics CRM Online 2015 Update 1. On the Apple App store, the version the users need is 1.1. On the Good Dynamics Marketplace or (Good Control Console), the version needed is listed as 1.1.0. 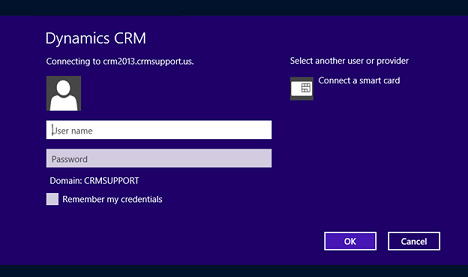 Users who have not updated their app prior to connecting to Microsoft Dynamics CRM Online 2015 Update 1, will likely see the following error approximately 2 minutes after connecting to Microsoft Dynamics CRM Online 2015 Update 1. Error: We’re sorry. Your server is not available or does not support this application. To fix this error, the user must uninstall and reinstall the Microsoft Dynamics 365 for Good app using the version listed above. Message: SEC7131 : Security of a sandboxed iframe is potentially compromised by allowing script and same origin access. Verify the source of the messages. If the source is Microsoft Dynamics 365 Server, these events don’t pose a security threat and can be ignored. To improve the reliability of DNS resolutions to Microsoft Dynamics 365 (online) organizations, Dynamics 365 for tablets modifies the organization URL used when signing in. When a user signs in, Dynamics 365 for tablets adds “—d” (two dashes + d) to the URL. For example, if the organization URL is https://contoso.crm.dynamics.com, Dynamics 365 for tablets will change the URL to https://contoso--d.crm.dynamics.com. If a user needs to retry signing in, they’ll see “—d” in the web address. They can sign in with the modified URL or reset it to the URL normally used. This can occur if the time on the device is not within a certain variance of the Microsoft Dynamics 365 server. For example: you may encounter this issue if the time on the server is 2 PM on November 11th but the device is set to 2 PM on November 12th. Cause: This can occur if certain directories under the Microsoft Dynamics 365 website have Windows Authentication enabled. 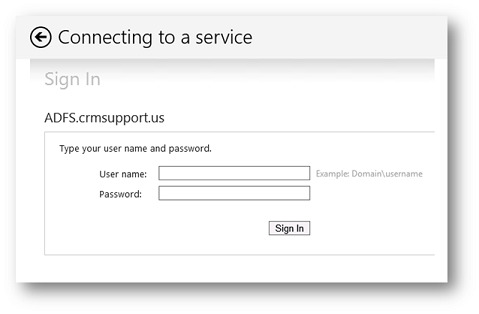 For Dynamics 365 for tablets to successfully connect to a new deployment of Microsoft Dynamics CRM Server 2013 or Microsoft Dynamics CRM Server 2015, you must run a Repair of Microsoft Dynamics CRM Server 2013 or Microsoft Dynamics CRM Server 2015, on the server running IIS where the Web Application Server role is installed after the Internet-Facing Deployment Wizard is successfully completed. For repair instructions, see Uninstall, change, or repair Microsoft Dynamics 365 Server. To resolve this issue by running Repair, the Microsoft Dynamics 365 deployment must already be configured for claims-based authentication and IFD. When the logon prompt appears, it is an Active Directory logon prompt instead of the sign-in page of your Secure Token xmlns="http://ddue.schemas.microsoft.com/authoring/2003/5" Service (STS) such as Active Directory Federation Services (AD FS). The prompt looks like the one shown here. After you tap Cancel or enter credentials 3 times, you see the correct sign-in prompt. URLs that redirect, such as IIS host headers or link-shortening websites such as tinyurl or bitly, do not work when you use the URL in the Dynamics 365 web address field with Microsoft Dynamics 365 for tablets or Dynamics 365 for phones during configuration. For example, an https://www.contosocrm.com host header for a Dynamics 365 (on-premises) website URL that is actually https://crm.contososerver001.com, will not work and will display an error message. To work around this behavior, you must enter the actual web address for the Microsoft Dynamics 365 (online) organization or Microsoft Dynamics 365 server (on-premises).When this issue occurs and you have enabled logging, the information logged is similar to the following. Notice that the URLs in lines 2 and 3 are different. That difference indicates a redirected URL. To enable logging, see Enable tracing for Dynamics 365 for tablets. For on-premises deployments, Microsoft Dynamics 365 web application and mobile clients are capable of multi-factor authentication (MFA) using Windows Server 2012 R2 or another authentication provider that supports MFA. Using MFA can help make client authentication more secure. Notice that using MFA requires that the device, operating system, and web browser are all MFA-capable. We recommend that you thoroughly test your MFA-capable devices running Microsoft Dynamics 365 to verify that your environment works correctly before deploying in a production environment. More information: Overview: Manage Risk with Additional Multi-Factor Authentication for Sensitive Applications. Users will not get customizations made to Dynamics 365 if there are draft records present. Users should be encouraged to save records as soon as they go online. In Dynamics 365 for tablets, record data is cached as the user visits the record so the user can access the data when going offline. This cached data persists after the entity is no longer enabled for Dynamics 365 for tablets (Settings > Customizations > Customize the System > [select an entity] > under Outlook & Mobile, deselect Dynamics 365 for tablets). To remove the cached data, the user must sign out of Dynamics 365 for tablets, or Dynamics 365 for tablets must be reconfigured or uninstalled. Windows 8: How do I close an app? Cause 2: You may be seeing a different form than the one you customized. If you have multiple forms for an entity, you will see the first form in the form order that you have access to. This is different than the web application where you see the last form you used and have the ability to change between forms. If you enable Private Browsing on your iPad in your Safari browser, you will see the following error message when you attempt to connect to your Dynamics 365 organization: “Microsoft Dynamics 365 has encountered an error.” You will need to disable Private Browsing. Tap the address bar, and then tap Private. When you try to access Microsoft Dynamics 365 (on-premises) using an internal URL on a Nexus 10 tablet in the Chrome web browser, the URL doesn’t resolve and you can’t access the site. For example, a URL in the form of https:// servername:5555 doesn’t resolve. This is a known issue with Android devices accessing IIS intranet sites. To work around this issue, select one of the following solutions. Use the fully qualified domain name to resolve the address, such as https://servername.contoso.com:5555. Use the server IP address, such as https://10.0.0.1:5555. For differences you can expect to find in the web app when you’re accessing it from a mobile device, see Support for Dynamics 365 for phones and Dynamics 365 for tablets. Microsoft Dynamics 365 System Administrators or System Customizers can access other users’ Clipboard data for users of Windows 8 and 8.1 devices. A user viewing records in Dynamics 365 for tablets can view records in another user’s queue. Users must update to the latest version of the Microsoft Dynamics 365 for Good application prior to updating to Microsoft Dynamics CRM Online 2015 Update 1. On the Apple App store, the version the users need is 1.1. On the Good Dynamics Marketplace or Good Control Console, the version needed is listed as 1.1.0. 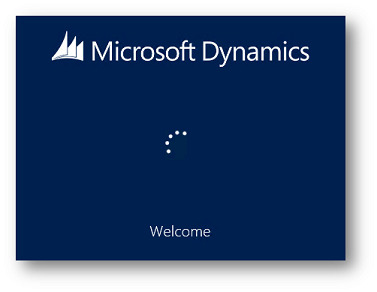 Users who haven’t updated their app prior to connecting to Microsoft Dynamics CRM Online 2015 Update 1, will likely see the following error approximately 2 minutes after connecting to Microsoft Dynamics CRM Online 2015 Update 1. To fix this error, the user must uninstall and reinstall the Microsoft Dynamics 365 for Good app using the version listed previously. After you reconfigure Microsoft Dynamics 365 for Good, the app can get stuck in a loop. You need to close and reopen the app. On your iPad, press the Home button two times quickly. You'll see small previews of your recently used apps. Swipe to find the Dynamics 365 for Good app. Tap the Dynamics 365 for Good app icon to launch the app and configure for the new org. For users of version 1.0 (1.0.0) of the Microsoft Dynamics 365 for Good app that have updated to Microsoft Dynamics CRM Online 2015 Update 1, note that the Prevent click for mapping setting does not work. To prevent click for mapping in version 1.0 (1.0.0), admins should enable the Require a secure browser for opening URLs setting in the Good Control server, as shown here. The Prevent click for mapping setting works as expected in Microsoft Dynamics 365 for Good app version 1.1 (1.1.0). We recommend updating to the latest version of the Dynamics 365 for Good app rather than applying this workaround. What are the specific symptoms you encounter? For example, if you encounter an error, what is the exact error message? Does the issue only occur for users with certain Microsoft Dynamics 365 security roles? Does the issue only occur on certain devices but works correctly for the same user on another device? If you attempt to connect to a different Microsoft Dynamics 365 organization that does not include your customizations, does the same issue occur? If the issue only occurs with your customizations, provide a copy of the customizations if possible. Does the issue still occur after uninstalling the app and reinstalling it? Please provide traces. See Enable tracing for Dynamics 365 for tablets. What type of device (ex. iPad 4th Generation, Microsoft Surface, etc…) are you using and what is the version of the operating system (ex. iOS 6.0, Windows 8, etc…)?